When you shop online with PayPal, we'll have your back. To ensure that you are able to receive our emails, please add "@e.paypal.com" to your safe senders list. For more information, please click here. We’ll refund the shipping cost if you need to return an item. When you shop online with PayPal, we have your back. We know you love to shop so we’re giving you a great excuse to discover new stores and find items you’ll love! By clicking Activate Now, you accept the General Conditions of Use. Please read the General Conditions of Use before activating the service. Shop the world without a worry. If you buy something that isn’t quite right, return it and we’ll refund your shipping costs. 1. Make sure you’ve already activated Refunded Returns. You’ll need to do this before you shop. 2. Fill out the online claim form within 14 days of returning your item. 3. Add your shipping receipts. 4. Submit. We’ll review your claim and refund the money into your PayPal account within 10 business days. How do I know this is not a fake email? Remember, fake or 'phishing' emails tend to have generic greetings such as "Dear PayPal member". Emails from PayPal will always address you by your first and last name. If unsure, forward the suspicious email to phishing@paypal.com.au and we’ll let you know if it’s really coming from us or not. *Up to 4 refunds per PayPal account for eligible purchases until 31st July 2015. A cap of $45 per refund request applies. 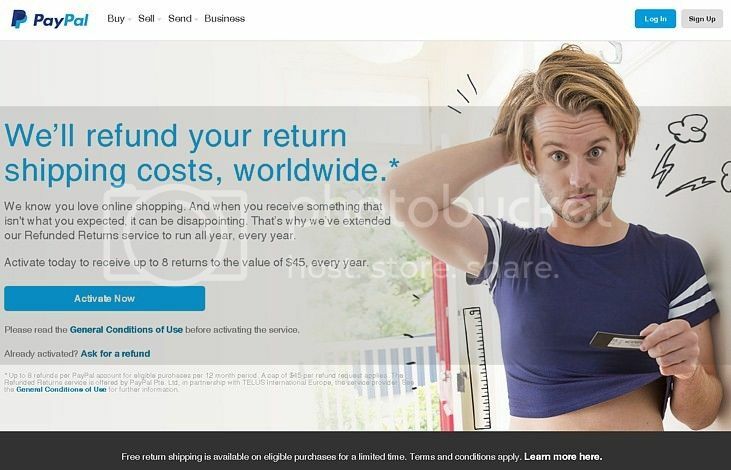 The Refunded Returns Service is offered by PayPal Pte. Ltd, in partnership with TELUS International Europe, the service provider. See the General Conditions of Use for further information. The PayPal service is provided by PayPal Australia Pty Limited (ABN 93 111 195 389) which holds an Australian Financial Services Licence, number 304962. Before deciding to sign-up for or use the PayPal service you should consider the Combined Financial Services Guide and Product Disclosure Statement, available at www.paypal.com.au. This email was sent to you, because your email preferences are set to receive PayPal marketing communications. To unsubscribe, click here and follow the prompts. Please do not reply to this email. We are unable to respond to inquiries sent to this address. For answers to your questions, visit our "Contact Us" page by clicking "Contact Us" at the bottom of any PayPal page. Smee, yes, it's genuine... but I don't like it. I don't like it even though as a buyer I would of course prefer not to have to pay return shipping for a faulty item. The reason why I don't like it is that, even though it's being paid for by PayPal, I have zero zilch nada nichts NO confidence in PayPal not slugging sellers for the cost of return postage further down the track. Sellers in the position of having to face the likely prospect of a significant number of their buyers demanding free returns (even if said buyers don't prove item was faulty on arrival) are either going to stop selling or increase their prices ludicrously to cover the inevitable losses they will be forced to incur. I already see far fewer of those sellers of weird and wonderful and collectable things. Do I want to do anything to further jeopardise those who have somehow hung in there...? No. Australian consumer law protects the consumer in the event of a faulty item being purchased. It does not provide for sellers having to refund the buyer's fuel costs or fare or time off work in having to return an item. It doesn't provide for online sellers paying buyers' return costs. NO NO NO. Don't like it. Don't want it. No. I, too, try to assess the risk in purchasing overseas and include checking feedback given to the seller, especially from previous buyers of the same product I'm looking at. This is one reason why I tend to strongly avoid sellers who have a high degree of 'Private' sales. Therefore, subject to what I have found to be a reasonably effective process to limit surprise and/or disappointment, I recently purchased an electronic item from China. There were a number of sellers offering this product and the one I chose did not have it at the cheapest price available - but they weren't far off it. Then came the wait ... 2 to 4 weeks. Fortunately, I only had to wait 2 weeks plus one more working day and although the operation of the device is fairly straightforward, I then put it aside for a day and made sure I had read through the manual to make sure there weren't any unexpected precautions to observe. Then it was a matter of batteries in - and let's check it out! Well, it all felt horribly empty when the first test - of the primary function of this device - produced a result that was patently wrong. All other tests of this prime function using various settings yielded the same disappointment. As a corollary to Murphy's Law, it seemed appropriate that all the secondary functions appeared to be working fine. However, since they rely on the correct operation of the primary function, their results were quite useless. So - then we get into discussion with the seller. Fortunately, the seller's communication has been reasonably good: a response to my messages within 24 hours and a conscientious attitude. The result: a request for return of the item and once the problem is confirmed, an offer to refund or re-send. One issue remains: who will foot the bill for return of the faulty product? The cheapest option that has tracking is just under $20. My argument is that I paid a specified amount for a functioning product to be made available to me at a collection point, which happens to be a PO Box. If I had purchased from a local bricks and mortar business, then the collection point would have been their shop. Where there is an issue with the product, I have no argument that I have at least the responsibility to initiate the return of the product as instructed and undertake travel to the collection point as part of that process. To cut to the chase ... my decision to purchase this item from China was comforted by the PayPal announcement, but I did not 'Activate' it at that time. However, since the Seller would not put up the $20 return postage, I Activated this service on my PayPal account and have put in a claim. From their spiel, I expect a response later this week. For those who don't want to read all that ^^^ - just read the black bits. using Visa Checkout which was like “getting some time back"
You're on the first step to being able to read my rather Dostoyevskian tomes-in-a-post, then. From their General Terms And Conditions, I should have expected a response "Within 5 business days" - a time period period which has passed - according to the Australian calendar. Just to be sure, I checked the public holidays for Bulgaria (the country in which the company who is performing the service for PayPal is registered and has its head office) and, as I see it, there aren't any days to consider. There is, of course, the possibility that the actual work is being done by people in other countries and they might have a holiday there. For example: Germany has Whit Monday - the 25th. If so, then the wait will extend by another 3 calendar days - but such a concession feels like I am making excuses for them. Maybe I was being over optimistic to expect a 'timely' response. 4. the customer expects a response. On the flip side - the actual parcel being returned has been travelling. Posted on the 22nd, on the 26th it was scanned at the Australian departure point (in Sydney, roughly 10km from the post office at which it was lodged). The next scan on the 28th shows it has arrived in China. Hmmm..... 10km in 4 days, then 7,500km in 2 days. Somehow that seems to feel right. Item was delivered in the afternoon of the 2nd of June. Still not a peep from the PayPal Refunded Returns people. Have you provided a postage receipt to them? Yes. I have provided a copy of the electronic receipt that Australia Post now offers as well as a photo of the package showing postage paid, return address and tracking number (among other things). According to the 'General Terms and Conditions', I believe this satisfies their requirements. Even if inadequate, they state if further information is required, I will have 7 days from the date they request it for me to supply it. So, either way, the ball is in their court. Two weeks along (at least double the time indicated wherein I should have expected a response) and I've heard nothing further. I've even checked my PayPal account to see if anything has turned up unannounced - but no. So I sent a nice email to the address given in the General Terms and Conditions for making inquiries. This email was a "Reply" to the original acknowledgement email - but I changed the "To" email address and the subject line. I also mentioned that the item had not only been sent, but had been received by the Seller. Within seconds of hitting the "Send" button, I received an automated reply which indicated there was a well thought out bit of software handling them. In this acknowledgement, not only had my request number been identified, but that the request itself had been updated. This was followed by a section headed with my Id and a timestamp (7 hours behind AEST) containing a summary of today's email - and following this was another section headed with my Id and a timestamp of the original request together with a summary of the detail and links to the images I supplied. The layout indicates to me that this email was generated from information extracted from a database - so it would seem my email today was received, identified and recorded on such a database, with a response email generated from this event. Somewhat impressive in itself, but it won't enthuse anyone who is just waiting for a result. I have received a reply! But - I had to laugh ... just a little. We apologize for the belated reply! It seems that we have not received your initial refund request, however, with your second email the online form and the attached files are available now. We are pleased to inform you that your refund request has been processed and you will receive a refund of $19.25 directly to your PayPal account within 5 business days. I take the response I received as coming from a human. The apology and describing the events point clearly to that. 1. My original lodgement of my request was captured, recorded on a database and acknowledged via email. 2. The trigger to add my request to the list of 'outstanding' requests to be processed (or some other enabler) failed. 3. My sending the follow-up email added another entry to the database, with this event triggering whatever needed doing in the first place. I doubt the whole thing is automated - but I suspect, wherever possible, automation has been put in place to minimise the human effort required. Nice idea - except for the (ahem) glitch. I have received the funds. It is for $19.25 AUD - which is precisely the sum it cost me to return the goods. This was the cheapest option that had tracking. The payment came from Telus International, which is the company providing this service on behalf of PayPal. The funds are now sitting in my PayPal account as a PayPal balance. From an affordability perspective, the numbers I have played around with strongly suggest to me that PayPal would not be interested in fully funding this service indefinitely. On the basis of, say, $100 purchases and a return cost similar to mine, it would take the PayPal fees from eight (8) purchases to fund one return. For a return cost of the maximum $45, it would require seventeen (17) such purchases. Factor into this the probability that (I expect) the greater volume of purchases will be less than $100 and the ratios get worse. For $50, the ratios are 13 and 30. Assuming we use the $50 transaction and moderate return cost, for PayPal to protect their existing profit by implementing this scheme - and fully funding it - they would need to take their present turnover and ADD 13 new transactions for each Refunded Return across their whole transaction base. To increase their profit by the fees from one transaction, they would need to add 14 new ones. Now, the numbers I have used here are extremely simplified, but they will give you some idea that the magnitude of the leverage required to achieve full funding by PayPal is not insignificant. * that buyers get to choose the service used for the return, with the only limitation being the $45 maximum. * making this service available will mean more people will return items than do currently. Bottom line - If implemented as a standard service, the likelihood that it will be Sellers who will be footing the bill is (IMHO) extremely high. I know - that was stating the obvious. Sometimes the obvious is simply not seen by the people affected. Human reluctance to see a looming threat... hoping that by staying still in the shadows the danger will pass...? It is certainly interesting to read your update, and I would agree that PayPal seem (to me) to be unlikely to implement this as a standard service funded by them (i.e., funded by PayPal). If it were to become standard, I would also agree that it is at least probable that the sellers would be paying for it. Seems the service is here to stay ... for an unspecified period, at least. Same deal as before (from a cursory read of the general conditions) but limiting it to 8 claims per year for up to $45 each. I know we've speculated - but I wonder how the Sellers are actually affected by this?